POLICIES AND REGULATIONS << 33 proval from the proper authority in charge of the area. no student pictures may be used in commercial advertising if the name of the University is involved. 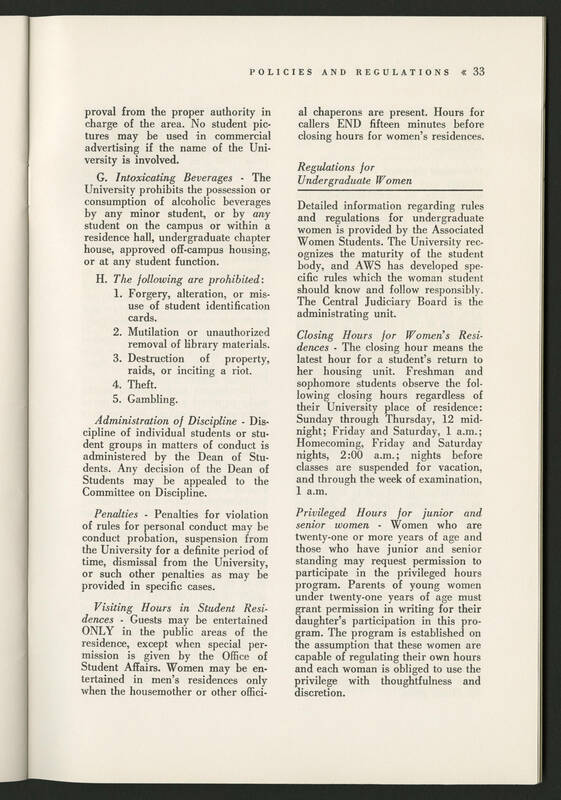 G. [italics]Intoxicating Beverages[/italics] - The University prohibits the possession or consumption of alcoholic beverages by any minor student, or by any student on the campus or within a residence hall, undergraduate chapter house, approved off-campus housing, or at any other function. H. [italics]The following are prohibited[/italics]: 1. Forgery, alteration, or misuse of student identification cards. 2. Mutilation or unauthorized removal of library materials. 3. Destruction of property, raids, or inciting a riot. 4. Theft. 5. Gambling. [italics]Administration of Discipline[/italics] - Discipline of individual students or student groups in matters of conduct is administered by the Dean of Students. Any decision of the Dean of Students may be appealed to the Committee on Discipline. [italics]Penalties[/italics] - Penalties for violation of rules for personal conduct may be conduct probation, suspension from the University for a definite period of time, dismissal from the University, or such other penalties as may be provided in specific cases. [italics]Visiting Hours in Student Residences[/italics] - Guests may be entertained ONLY in the public areas of the residence, except when special permission is given by the Office of Student Affairs. Women may be entertained in men's residences only when the housemother or other official chaperons are present. Hours for callers END fifteen minutes before closing hours for women's residences. [italics]Regulations for Undergraduate Women[/italics] _____________________ Detailed information regarding rules and regulations for undergraduate women is provided by the Associated Women Students. The University recognizes the maturity of the student body, and AWS has developed specific rules which the woman student should know and follow responsibly. The Central Judiciary Board is the administrating unit. [italics]Closing Hours for Women's Residences[/italics] - The closing hour means the latest hour for a student's return to her housing unit. Freshman and sophomore students observe the following closing hours regardless of their University place of residence: Sunday through Thursday, 12 midnight; Friday and Saturday, 1 a.m.; Homecoming, Friday and Saturday nights, 2:00 a.m.; nights before classes are suspended for vacation, and through the week of examination, 1 a.m. [italics]Privileged Hours for junior and senior women[/italics] - Women who are twenty-one or more years of age and those who have junior and senior standing may request permission to participate in the privileged hours program. Parents of young women under twenty-one years of age must grant permission in writing for their daughter's participation in this program. The program is established on the assumption that these women are capable of regulating their own hours and each woman is obliged to use the privilege with thoughtfulness and discretion.